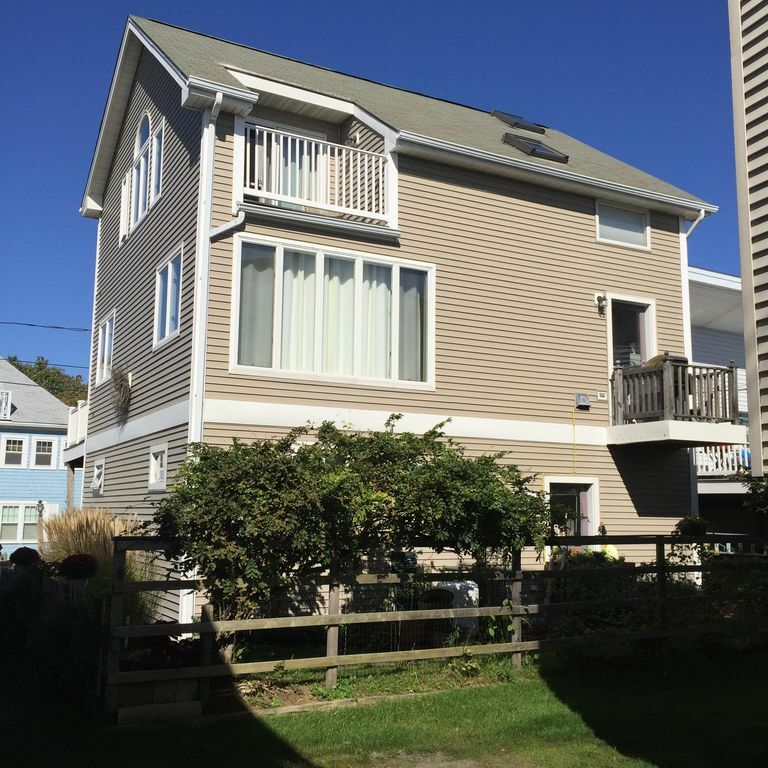 Stay just steps away from the soft sand of beautiful Long Sands Beach in York, Maine. This lovely 5 bedroom post and beam home w/ Cathedral ceilings, two decks and a patio is the perfect spot for your summer or fall vacation. Spend the day with your family relaxing at the beach, try a surf lesson, make a giant sand castle, or enjoy a leisurely walk on 2 miles of sandy shore collecting sand dollars. Come back to the house and enjoy a family barbecue or lobster bake on the back porch or patio. The dining room table seats 12. There is a total of 3 large screen TV's for family enjoyment, including a collection of great movies, board games, and books along with WiFi throughout the house. It is just a short walk to wonderful restaurants, shops and the famous Nubble Light House. The Trolley stops right at the corner and will take you for a ride to visit Short Sands Beach where you can see taffy being pulled at the famous 'Goldenrod' candy shop, test your skills at FUNORAMA or enjoy some music at Ellis Park. Don't forget to bring your favorite beach chair!! The beach house has been a gathering spot for the Knowles Family for over 45 years. The original beach cottages were replaced with the house in 1988 when Harold and Ellen retired and was built by my husband Mark Knowles. We purchased the house in 2005 and rented it for a few years before we decided to enjoy it full time. It is the perfect spot for that family photo you've been wanting to capture. The photo above is a picture of me and my four beautiful daughters on Long Sands. We hope that you and your family will create as many wonderful memories as we have. There are 3 bathrooms. The first level suite has a 3/4 bath (shower), the main level has a 3/4 bath (shower), the top floor has a full bath (shower.tub) and is being renovated. There is parking for 3 large vehicles only. We can help you with additional parking if needed off site. Kitchen, bathroom and beach towels are provided. There is also an ice maker on the first floor to fill your coolers for the beach. Dining area views Long Sands Beach. Table opens up to serve 12 guests. Master Bedroom has a nice deck overlooking Long Sands Beach. There are two decks. One off the Master Bedroom with a view of Long Sands Beach. The other is off the Living Room. Patio on the main level. This property runs from Saturday to Saturday during the Summer High Season June 29 - September 3, 2019. 7 Sea Rose Lane is the first right off of Oceanside Avenue. It is across from the bath house on Long Sands Beach. Maximum occupancy of 10 guests. Please ask the manager or check their rental agreement when booking the property. The property is a Saturday to Saturday rental during the High Summer Season.